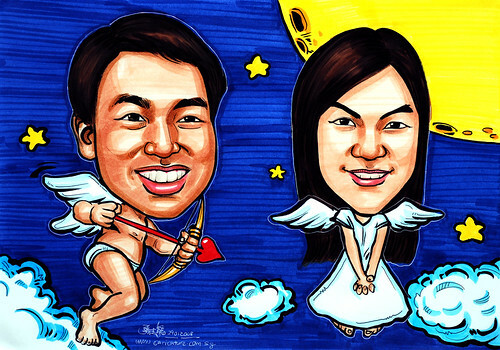 He wanted to be the cupid with a 'heart' arrow, and she will be the angel. Noticed the overlapping lines of the dark blue sky? This was the nature of colour marker. When you colour over the existing patch, it will add on another layer. It would be good for building up shades and textures for the facial muscle etc, but not for smooth area like sky and flat colour background. That's why I seldom colour the sky. I would leave it blank instead, add in the clouds and birds etc. It can't help in this case, since we need a dark ble sky to bring out the night sky effect, with moon and stars.